Sincerity is the middle name of actor HWANG Jung-min. Ode to My Father is about the life of Duk-soo. In this film, HWANG played the character from his twenties to seventies. Many believe that without HWANG, the film could not have left an impression on audiences. The most recognizable feature of his acting is that it isn’t artificial. But this does not mean that he projects himself on his characters either. HWANG builds a triangular relationship among the actor, audiences and the character. HWANG knows that an actor’s excessive immersion into his character backfires, failing to win over audiences. The seasoned actor also understands that if an actor keeps too great a distance from his character, sincerity will evaporate. HWANG embraces his characters just outside of the borderline from damaging their true purity. Thus, sometimes, it seems that he chooses typical characters. And perhaps some may think HWANG doesn’t take acting seriously. These points can be attributed to the fact that his approach to his characters is very instinctive. HWANG has a power to simplify a complicated mechanism called ‘acting’ as much as possible. Most of all, the actor is quite skilful at stimulating audiences’ feelings. Afterwards, HWANG showed the extremity of manhood by combining a wide array of tones and feelings. If president BAEK in A Bittersweet Life (2005) is the extreme of a dirty villain, Seok-jung in You Are My Sunshine (2005) is a man of extremely pure love. In several films, HWANG tried opposing characters. He attempted to play a character with a vague feeling in the psycho thriller Black House (2007) whereas he crossed realities and imagination in A Man Who Was Superman (2008). But audiences were most excited about films where HWANG’s characters exploded. Bloody Tie (2006), The Unjust (2010), New World (2013) and Man In Love were such examples. 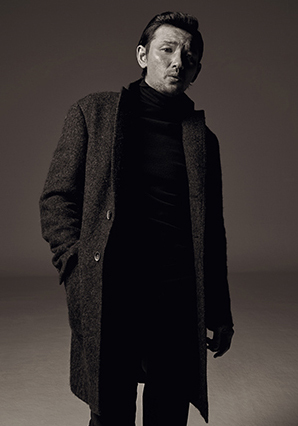 Characters struggling in the world of crime were deemed as films suitable for HWANG Jung-min. However, in Ode to My Father, HWANG escaped from his previous masculine characters and plays an ordinary person. This film made HWANG a more trusted actor, beyond a performer with excellent acting skills. If HWANG’s images in his previous films are of typical males, Duk-soo in Ode to My Father is a character who labors through his life with a sense of responsibility as a good son, father and husband. Now, whatever character HWANG selects, the respect which he earned by way of Ode to My Father will follow him.